The Stein/Baraka campaign is horrified and outraged at the militarized repression of water protectors at the Standing Rock reservation in North Dakota. Police and private security forces have engaged in violent actions against peaceful earth defenders who have come to protect the land and water from the construction of the Dakota Access Pipeline. We condemn the violent repression of the peaceful protests against DAPL as human rights abuses, including the use of attack dogs and pepper spray against peaceful demonstrators, the persecution of journalists, the authorization of weaponized drones, the disruption of prayer ceremonies, and the desecration of sacred burial sites. These are not the actions of public servants sworn to protect and serve the community, but the unconscionable oppression of an occupying army against the original inhabitants of this land. In 1854, a few thousand people gathered in Jackson, Michigan to launch an independent challenge to a national political system dominated by two parties. "Of strange, discordant, and even hostile elements," a party leader later recalled, "we gathered from the four winds…[with] every external circumstance against us." This challenge was fueled by the radical abolitionist movement that united white workers and formerly enslaved Africans against the criminal institution of slavery, as a response to the political crisis caused by the Kansas-Nebraska Act. In just two years, this insurgent third party — created by movement activists — had gained ground across the Northern states, challenging the Whig Party. In short order this insurgent "third party" had become a major opposition party. By 1858 they had won an influential foothold in Congress, and by 1860, that party leader — Abraham Lincoln — was elected President of the United States. The Green Party Presidential ticket of Jill Stein and Ajamu Baraka released a statement today in response to recent controversy surrounding Donald Trump’s warnings that the presidential election may be rigged, as well as Democrats’ warnings that Russian hackers may try to interfere with the vote. Our nation — and our world — face a perfect storm of economic and environmental crises that threaten not only the global economy, but life on Earth as we know it. The dire, existential threats of climate change, wars for oil, and a stagnating, crisis-ridden economic system require bold and visionary solutions. In this election, we are deciding not just what kind of a world we want, but whether we will have a world at all. There is a growing concern in advanced economies that governments are running out of options to stabilize a precarious and volatile global economic system. Since the onset of the Great Recession in 2008, the Fed’s large-scale bond purchases, called quantitative easing, have helped push interest rates close to 0% and have done more to serve Wall Streets’ interests by way of propping up the stock market than by boosting the overall economy for average Americans. 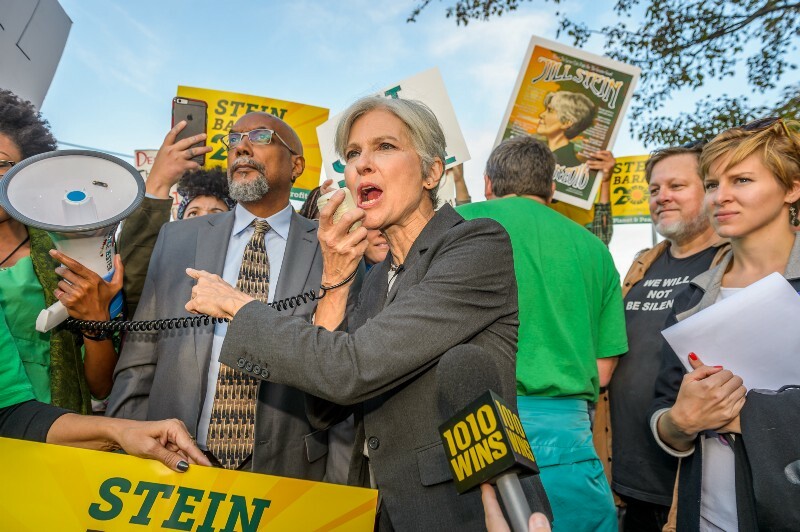 Jill Stein and Ajamu Baraka, Green Party candidates for President and Vice President, called today for Americans of all political persuasions to come together to support ranked choice voting. Ranked choice voting, which is already used in cities across the country, is on a statewide ballot for the first time in Maine. Stein noted: “Voters across America are frustrated by our broken voting system. Although the Democratic and Republican parties dominate our government at every level, 57% of Americans polled this year agreed that a new major party is needed because the establishment parties do such a poor job of representing us. Yet even after these parties nominated the most unpopular presidential candidates in history, most voters currently plan to support them, although an incredible 57% are basing their choice primarily on fear of the opposing candidate, according to a recent poll. We were treated to a double “October surprise” on Friday, Oct. 7. The video of Donald Trump crowing that his celebrity status entitles him to assault women slightly eclipsed Hillary Clinton's leaked speeches. But we still learned that Clinton holds "public and private positions," that her populist promises regarding free trade, preserving Social Security, and checking the power of Wall Street probably won't survive Inauguration Day. Millions of voters have figured out that the two major parties don't represent them. They're right. It's not a two-party system, it's a two-party racket. They're frustrated with a choice that, we're told, is limited to two nominees with deep disapproval ratings. Voter dissatisfaction is reflected in polls that show broad support for a choice of more than two on the ballot. A voter revolt is brewing in America. People are fed up, and they should be. The super rich are destroying our economy, sending our jobs overseas and making our planet uninhabitable. But instead of offering real solutions, the two-party system has produced the two most disliked and distrusted candidates in history. In a Fox News poll from Sept. 30, 57 percent of voters said their choice in the presidential election is motivated primarily not by enthusiasm, but by fear of the other candidate.Democrats and Republicans have lost ground to independents, now the largest voting block. Meanwhile, an incredible 57 percent of Americans polled recently by Gallup say the Democratic and Republican parties have failed and we need a new major party. In short, the American people are ready for real competition to the two-party system.